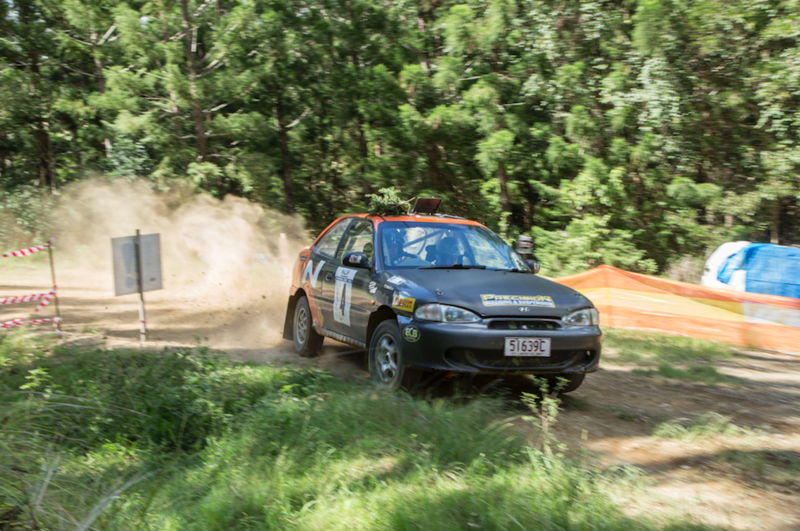 The first round of the KCF Rallysport Short Course Rally Series was held on Saturday, in Glastonbury west of Gympie, Queensland. It was a pace noted competition running three passes over two undulating, twisty and challenging stages. A mixed field of 22 teams from southeast and central Qld started the compact event, however with only 12 cars going the full distance simply finishing was a fine achievement for all. The classes were simple, Four Wheel Drive, Front Wheel Drive and Rear Wheel Drive. Winning the Short Course Rally was Shaun Dragona and Ray Priest (Dasha Racing) in their 2005 Subaru WRX Sti. They also won the 4WD class. 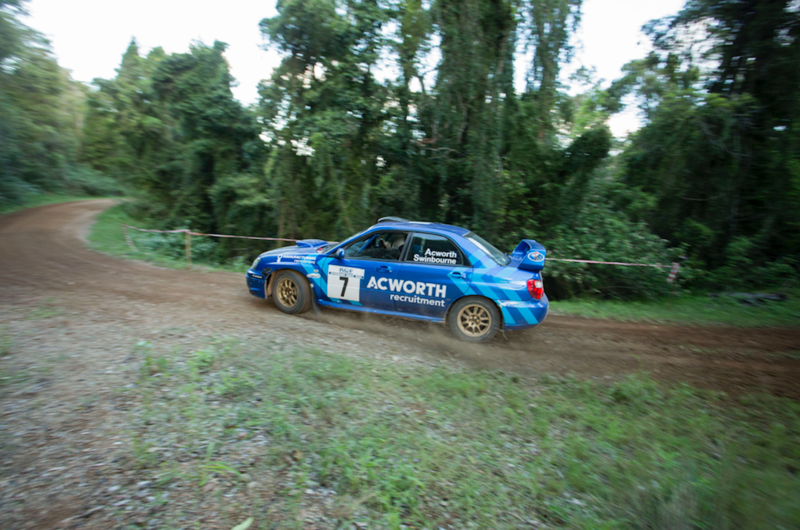 Second outright was the capable team of Kim Acworth and Ian Swinbourne in “Bruce” the 2004 Subaru WRX. 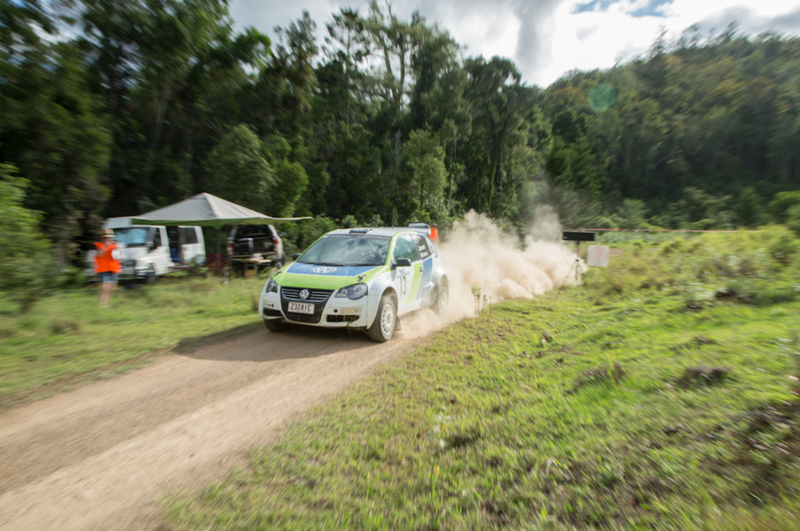 Third place and first 2WD was Marco Jansen and Ben Logan screaming along in their 2007 VW Polo. Only 2 seconds behind the Polo was a tie for fourth between the RWD class winner of Chris Wedding and Wayne Jefferies in their 1970 Datsun 1600, and Adam O’Brien and Matt Sosimenko in a 1992 Mazda Familia GTR. The very first stage claimed a number of top competitors. Gerard McConkey and Larisa Biggar (Living Here Wilston) in a 1999 Subaru WRX suffered a broken control arm. Adrain Coppin and Erin Kelly (Innate Motorsport & Event) in their Mitsubishi Lancer Evo 9 dropped a turbo pipe, however once repaired they used the event as a test session. 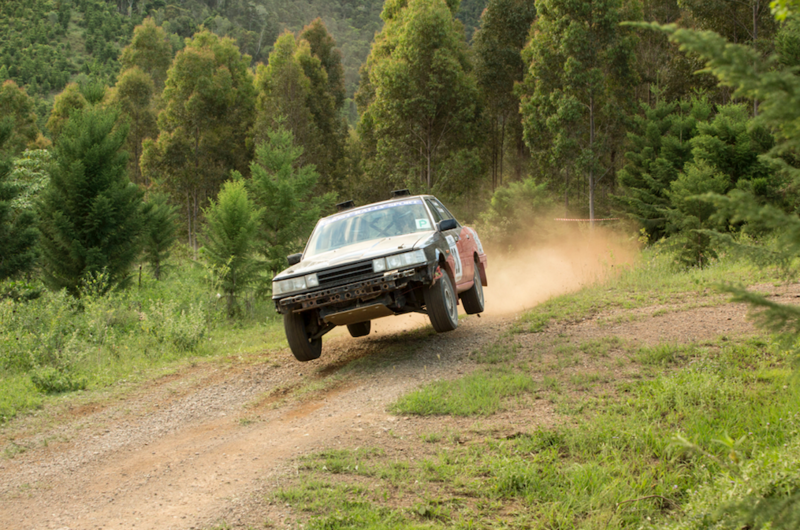 Last year’s winners Tristan Carrigan and Neill Woolley in “Lucky” the Hyundai Excel added some aerial maneuvers to their notes, but unfortunately “Lucky” didn’t nail the landing and rolled. Further into the day while Craig Aggio and Megan Benson were have a ding dong battle in their 1978 Toyota Corolla KE30 with the winners they dropped a fan belt and managed an in-stage repair however the time lost was too much for a placing. During the presentation all competitors thanked the event organisers, Brisbane Sporting Car Club, the volunteers, and sponsor Keith Fackrell of KCF Rallysport who supported the event from afar. Round 2 of the KCF Rallysport Short Course Rally Series will be in Benarkin on August 10.